If you follow certain steps you can get rid of pantry moths and it is also important to prevent them from ever returning. Pantry moths are not only annoying when you see them flying around in your home but they can also wreak havoc on your cupboard. To discover your stored food infested with pantry moths is a real stomach-turner. 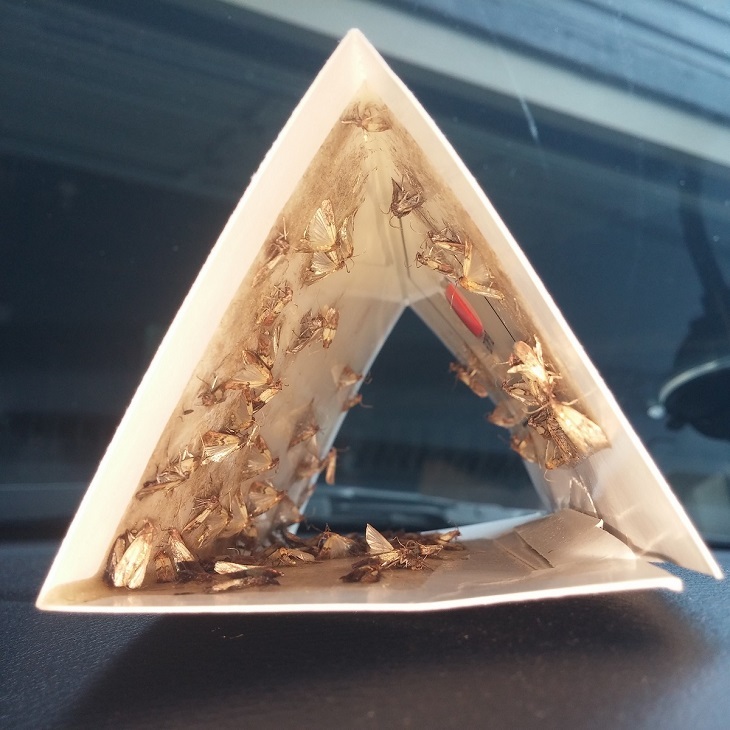 Pantry moths are destructive pests, they can eat through packaging and they lay eggs on food. Even if you keep your pantry and kitchen cupboards clean and tidy, these tiny buggers can show up from time to time. It happens to the best housekeepers. But how do pantry moths get into your home in the first place? Well, it is most likely that the small almost invisible eggs come into your home inside of food packages. Then later they hatch into larvae and eventually turn into moths. 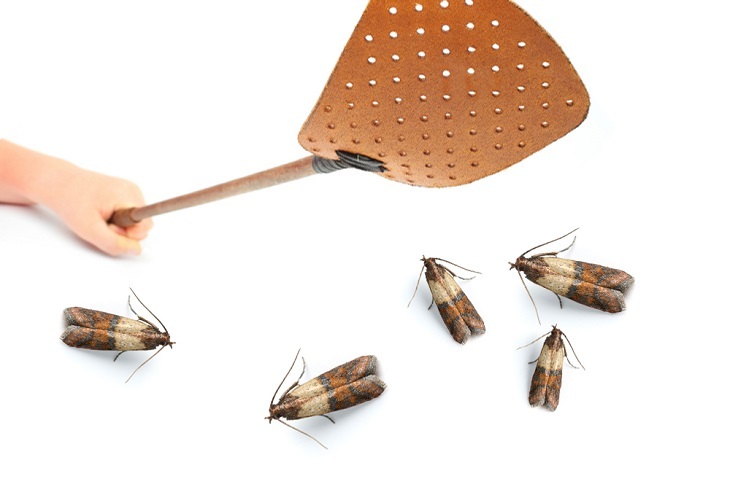 Here’s our tips on how to get rid of pantry moths. When you see a pantry moth flying around you have to inspect every single package of food laying around in your kitchen cupboard or pantry. You must empty all the cupboard and literally go through everything one by one especially cereals, flours, nuts, biscuits, grains, crackers etc. You should also check pet food, dried fruit and even dried flowers. Remove every can, box, bag or bottle and make sure to check under the lids of the jars and canisters. Also investigate the corners, edges and hinges of the cupboards. What you are looking for – besides the obvious moths and larvae – is also webs and clumps of stringy or grainy material in the food. Throw away everything that is contaminated and also those that you are not sure but suspicious about. If you don’t want to loose so much food, you can alternatively place every open package of grains or muesli into the freezer for a week. This way you can kill the moth eggs. If you find little holes on the packaging, bin it straight away. Remove the shelves from the cupboard in the affected area, if you can. If not, use a vacuum cleaner to hoover every little corner. Now you can wash the cupboard with hot soapy water and vinegar (50-50 solution). 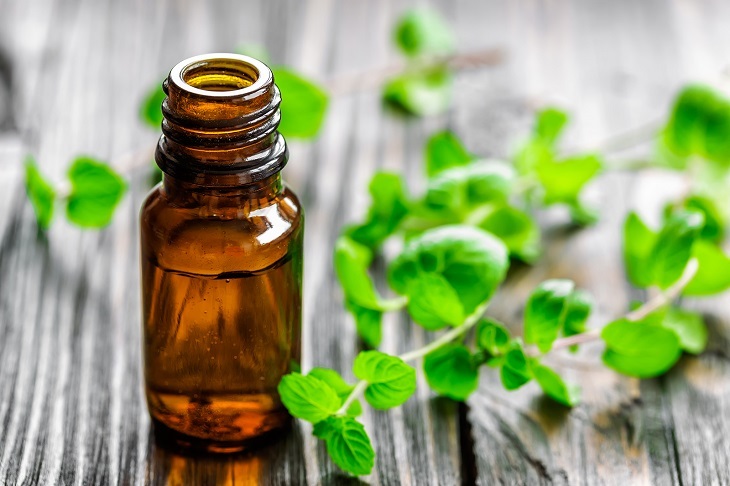 If you have essential oils at home, add a few drops of peppermint oil to the water. Pantry moths hate peppermint and vinegar also. Wash the hinges and door knobs as well as the cupboard walls and ceilings. Even if a container looks clean and untouched, it is a good idea to empty it and put it through the dishwasher. This way you can actually see the content better and make sure that it really has not been infested. Wash all containers under hot soapy water. Also you can add vinegar or bleach to the water. Since pantry moth thrive on moisture, you want to make sure that you clean and dry every corner thoroughly. Ideally leave the cupboard door open for a day after you cleaned everything before you start putting back the food on the shelves. Dry all food containers completely before putting food back in them. Keep it tidy and close the canisters tightly. You have to make sure that absolutely everything that goes back in your kitchen cupboard has a container! The best is to use airtight containers or jars from good brands. Storage containers are the best way to keep the variety of crackers and nuts not only fresh but also pantry moth free. Now after you have made all the effort to get rid of the pantry moths, don’t forget about the bin! Make sure to get rid of the bin bag containing the contaminated food as soon as possible. You will also have to get rid of the vacuum bag. Keep the trash far from your house. There are certain things that pantry moths hate such as vinegar, peppermint oil, eucalyptus oil and bay leaves. Instead of using bleach, use vinegar to wipe the shelves with. Poor a small amount of eucalyptus oil or peppermint oil on a cloth and wipe the shelves, inside and outside of the pantry doors as well. After you finished cleaning, spread bay leaves everywhere. It repels pantry moths, so make sure to put a few bay leaves on each shelf and in every drawer. Also you can add a bay leaf directly to your canister of flour, rice, or other dry food. We already mentioned earlier, that placing food items into the freezer for a week, kills the moth eggs and thus prevents them returning your pantry. 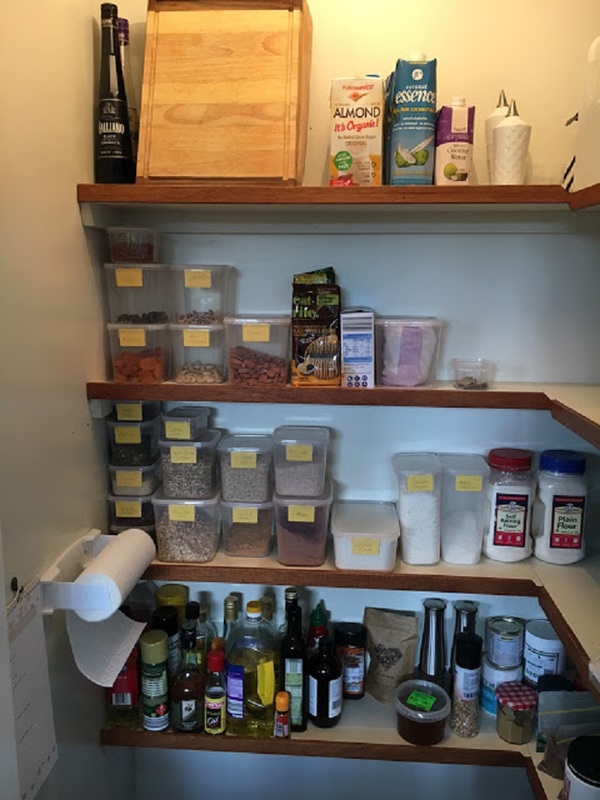 If you don’t have a container for food items such as flours, you can just store them in the freezer until you use them or have enough space in the container for them. Also there are some great products that can help you getting rid of moths, for example the pheromone moth traps. We hope, after you do all the above mentioned steps, you will never spot pantry moths again. However, if the problem hasn’t gone away, you can repeat the steps above. 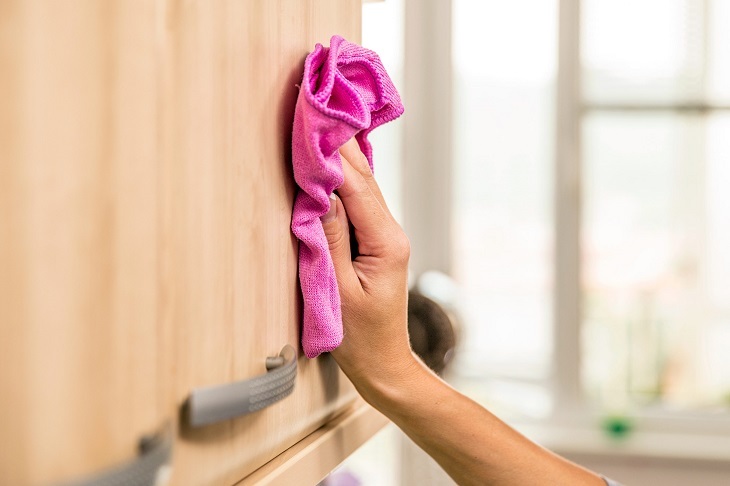 Always act quickly in order to limit their spread and wipe the cabinets regularly with vinegar. Plus whenever you purchase new dry items – flours, grains especially – remember to store them in the freezer for a few days before putting them into a storage container. Gledajući Vaše priloge , daliste mi ideje kako urediti ostavu ili špajz sa pakovanjem svih dodataka za kuhinju. Već ovih dana idem u kupovinu prozirnih zdjelica i sređujem ostavu. Zatim imate i prilog za ulje od peperminta, to moram uzeti rječnik engleskog jezika i vidjeti njegovo djelovanje na zdravlje, na koje polažem dosta vremene. Dobro je gledati Vaše priloge. Teodora. Bosna i Hercegovina, konaćno. Thanks for sharing the tips. Pantry moths can be such a pain, so it’s important to keep everything dry to prevent them from finding a way in.